There's big new fun in our household these days - the laser pointer. 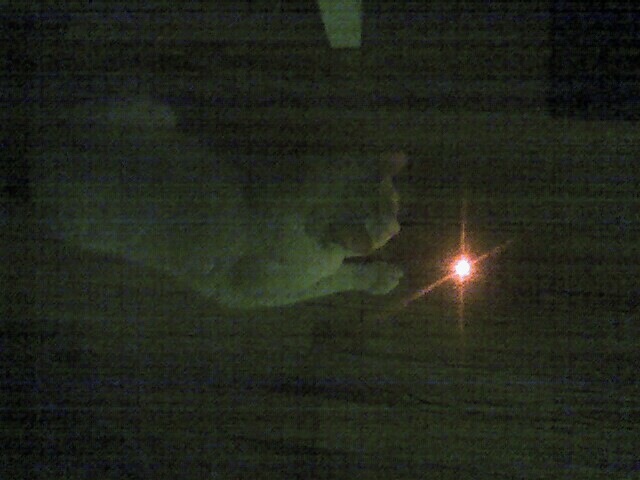 I've heard for years, and read tons online, about how laser pointers are great cat toys. But I've always thought that it wouldn't work for us, that it would be either boring or just too easy for my smart boy Joey to enjoy. Boy was I wrong. Most of you may know that, as far as I'm concerned, Joey is a perfect cat but for one small flaw: he wakes up, and wakes us up, every morning between 5:30 and 6:30 am. He meows for about 30 minutes and then goes back to sleep, right next to me. I've done a bunch of research on how to cure this, and most of the blogs and forums I've read suggest to tire him out before bed, so he'll sleep longer. So we've been using the laser pointer for his nightly exercise - now Joey goes to bed most nights completely exhausted and we've had a good laugh at his expense. But we're still up at 5:30 am! Damn. Comments on "Joey and the Giant Pointer"
Wow! You really convinced me with that detail about the sofa ;). I'm definitely going to try this with our cat, thanks for the tip! And send Joey on over - we keep hitting the snooze button, so some extra meows at 5:30 would work PERFECTLY!